Here are some ways you can make a difference right now. 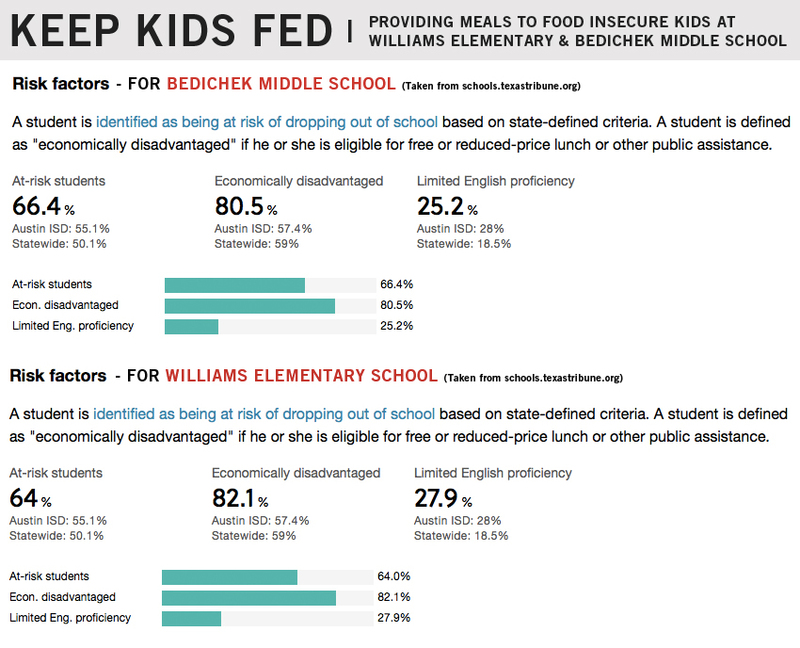 Most of the students at Williams Elementary and Bedichek Middle School rely on the school for their meals during the week. That's why we're partnering with school officials to offer free breakfasts and lunches to food insecure kids during the weekends and holiday breaks! Join us on this mission by simply picking up some of the items below and bringing them to church on Sunday. Or for as little as $6 a weekend, you can help us Keep Kids Fed. We're currently feeding 101 kids every week from Williams Elementary and Bedichek Middle School. We're a Literacy Partner with Education Connection at Williams Elementary. Our mission is to make sure that every child can read by the 4th grade. Studies have shown that one-on-one reading time with children can greatly increase their chances of literacy. We are reading to kids at Williams Elementary on a weekly basis. Please join us and make a difference in the life of a child. Consider volunteering 30mins a week to read to 2 children (15mins each). I'd like to sign up to read to a child once a week! Every Sunday we get to see God move in some pretty awesome ways, but none of it would happen without our Sunday morning crew! If you have a passion to make a difference, we need you. We have positions available in many areas like, Bus Driving, Sound Tech, Worship Team, Kids Ministries, Greeters, Ushers, Setup/Tear Down Team, and more. Just fill out the form below. I want to serve on Sundays! We provide groceries to anyone in need through our food pantry. If you would like to help with this awesome ministry, sign up below. If you are in need of food, sign up below for pickup. We Are Here To Reflect The Wonder & Beauty Of Jesus And Join Him In The Renewal Of Our City! So...we adopted a road! Because we love Jesus by serving our community.